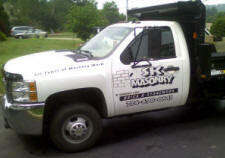 In recent years we have expanded to offer truck and automobile lettering. We can cut color corporate logos for most major businesses (you must have permission to use these logos) and can scan your xisting artwork and convert it to vinyl. We can also develop a custom logo and design for your vehicle to add a professional look! We have over 60,000 corporate logos on file and will work with you closely with you to make sure the colors and design are a fit with your particular business and vehicle. in the Worcester, MA area for an additional fee. Please call 508-335-5554 for more information.